It's legal - now what? It’s legal – now what? It’s official. Canada’s legal adult recreational cannabis marketplace is open for business. Opening day was marked with symbolic celebrations across the country as people lined up to buy their first legal recreational cannabis. It signalled the end of prohibition. Even product shortages – which had been widely reported and was expected to happen – failed to dampen the vibe. For so many activists, Oct. 17th marked the end of an era of prohibition and black propaganda. The day provided even more cause for celebration as the federal government announced it will pursue a legislative path to pardon those convicted with simple possession of marijuana. According to data from the Canadian Centre for Justice Statistics, 58 per cent of police-reported Controlled Drugs and Substances Act offences were cannabis-related, and nearly 80 per cent are possession offences. Cannabis-related convictions have also been declining in the last five years. Decriminalizing marijuana possession scores another victory for cannabis activists and civil rights advocates. So yes, the finale to a decades-long struggle, it seems, has finally arrived. For a burgeoning industry on the cusp of capturing a billion-dollar-market, however, this is only the beginning. From this point forward, whatever we do will define and shape the Canadian cannabis industry. Canada has the opportunity to show the rest of the world the way forward in creating a safer, more meaningful alternative to prohibition, with economic benefits. The world is watching us and learning from Canada’s experience. Our regulations will continue to evolve and be perfected, and the cannabis industry will also evolve and perfect itself. In light of developments here in Canada, our neighbour to the south has issued a reminder to visitors that anyone working or investing in the cannabis industry could be refused entry to the United States. Although more than half of U.S. states have legalized marijuana – either recreationally or for medical use – the substance remains prohibited under federal laws, which govern border crossings. 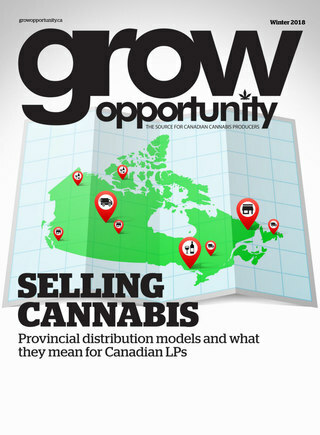 The growth of this industry in Canada is happening at lightning speed and it’s easy to forget that almost everything that’s transpiring is unprecedented. Canada is leading the way in this new world paradigm and other markets are closely behind. No other developed country in the world has been where we are right now. The U.S. no entry policy for travellers with ties to the cannabis industry seems petty in the face of a massively burgeoning legitimate industry this part of the border. Unfortunately, that’s the current reality. It is bound to change – when and where will depend on how effectively Canada can demonstrate to the world we are on the right side of history. Speaking of growing, I am happy to report that beginning in 2019, Grow Opportunity will be published six times a year (from the current four times a year frequency), providing more opportunities to engage our readers.